Emergencies happen when you least expect them. And they can happen at the most inopportune times. You can’t leave your radio on 24/7 just in case there’s a storm coming? Or can you? Thanks to Oregon Scientific, you don’t need to. Their new WR601 or WR601N emergency portable weather radio will alert you anytime there is a broadcast from the National Weather Service or local Emergency Alert System. Working in standby mode, the WR601 is perfectly quiet – but it’s monitoring the airwaves waiting for that emergency broadcast. When the emergency broadcast starts, the radio jumps into action, turning its audio up and blaring a warning alert. Within seconds, the broadcast is played, telling you exactly what’s going on. S.A.M.E. technology insures that you only get alerts for your immediate area. Each week (usually on Wednesday about noon) the weather service puts out a test signal so you are always sure the radio is working properly. Other than that, when you hear the radio turn on, it’s nice to know you are getting the most up to date information available about a pending storm or other emergency. Now there’s no excuse for being caught by surprise, even when you are traveling. 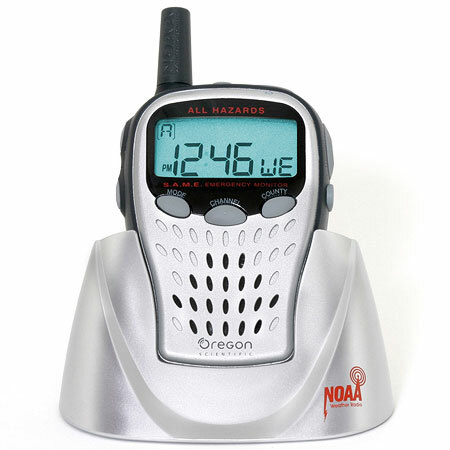 Check the Oregon Scientific website for more information on the Emergency Portable Weather Radio.